Grab your coffee and the paper and enjoy the view. 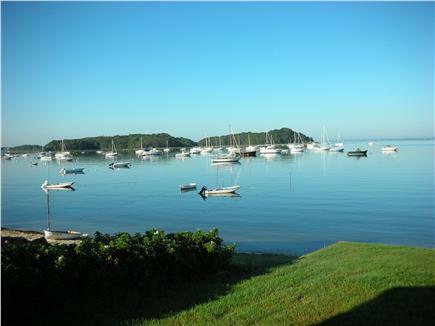 Ideally located in the village of Monument Beach on the ''Cape side'' of Cape Cod, this beautiful, beach house welcomes you to relax with family and friends. 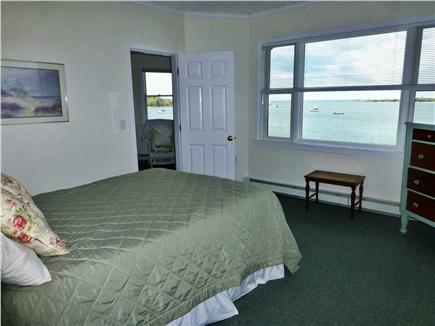 The house has four bedrooms; all with water views of picturesque Phinney's harbor. 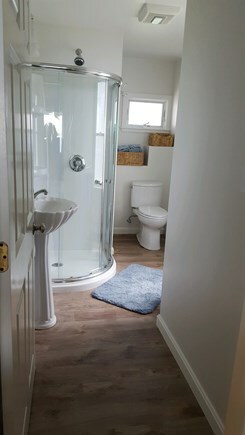 2 full baths,one on the main floor, ( new as of spring 2017) and one upstairs, an outdoor shower, and a floor plan that allows family and friends to enjoy each other, watch a ball game on the HD TV, while also enjoying quiet time to read a book or complete a puzzle. The sandy private beach located directly in front of the house, has warm water and excellent wind conditions for wind surfing and lots of beach fun. 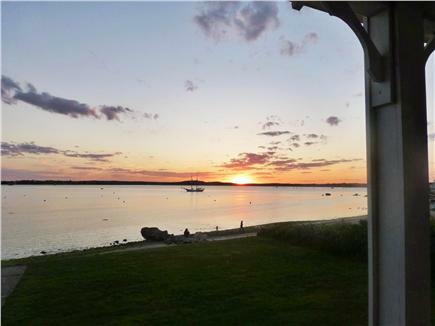 At the end of the day, relax on the 50' porch and enjoy one of the most picturesque sunsets found on Cape Cod. Need to bring the office with you? 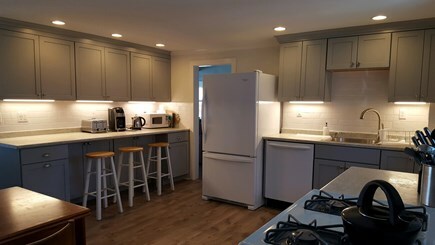 Pack your laptop and hook up to our high speed internet connection.The house is a short bike ride to the Cape Cod Canal bike trail and a 20 minute ride to Woods Hole where you can grab the ferry for a day trip to the Vineyard. 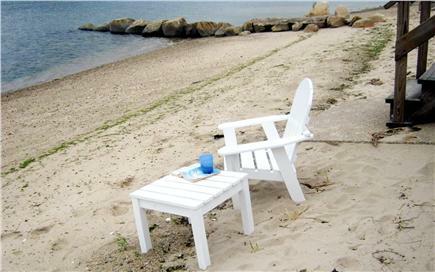 Back at the house, we will provide you with beach and lawn chairs, beach towels, as well as sand toys for the kids. The house is located near a park where the kids can play on the swings, while the adults play tennis or a game of baseball. After dinner, you can take a 2 minute walk to the Whistle Stop for the best ice cream on Cape Cod. We had an amazing time this past week in the cape. Despite the weather being a bit cool and some rain, the location was great and the house was a perfect home base. Having the beach steps from the door and a playground literally next door, our kids were never bored. I can’t begin to tell you how perfect your cottage was for us to all get together. And the weather was ideal too. Sitting on the porch, sharing a meal at the large table, sitting around on the sofas in the evening and reminiscing….just perfect! It’s a most blissful place. Thank you for sharing it with us! Beautiful waterfront home with endless views. 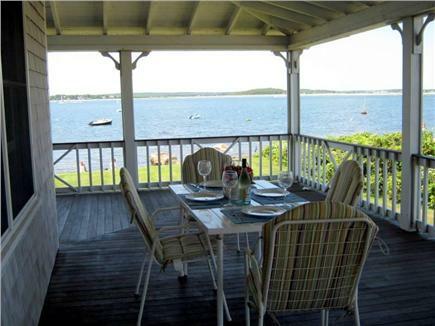 Huge wrap around porch with wonderful lawn extending to the water, and plenty of parking. All appliances worked, there were plenty of utensils and dishware, and beds were comfortable. As you can see from the photos, this is not a designer home, this is a great family home with tons of Old Cape Cod flare. We visited in October and the neighborhood was very quiet and private. This is a perfect place to take a step back from the hustle of life and unwind and relax. This beautiful home made for our best family vacation yet! There was plenty of room, everything you could need or want for a week at the beach is provided by the fabulous owners. 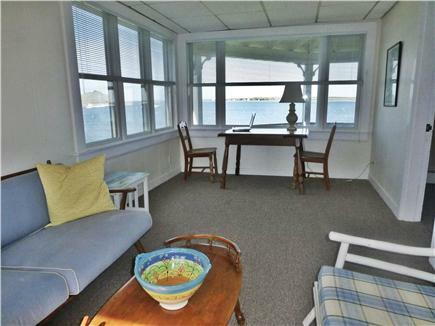 We spent most of the week on the wide wrap around porch, morning and night it is the perfect spot to watch the kids at the playground or beach. We had every meal outside on the porch. The area is quiet and family friendly. Joan and Jane were so pleasant and easy to deal with. 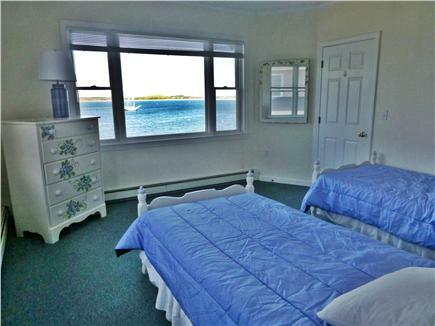 They have made this beach house the best vacation spot on the Cape! We have three small children and having the playground next door to the house was fantastic! The house is easy to find and centrally located to all the necessities! It had everything we needed. The views were OUTSTANDING! We greatly enjoyed our stay!!! We are thrilled you enjoyed your stay in our home, and we look forward to your return. Let us know when you want to come back as we are already booking for next summer!! We loved having you and your family. We are thrilled you enjoyed the house and look forward to your return next summer.